Just added this beautiful pendant to our collection. It’s our finest piece. This featured item is discounted 20% using the Coupon Code above and includes free shipping in USA. Every item in our inventory is handmade, so once it’s sold it’s no longer available but can be special ordered. That’s it! No gimmicks, no tricks. If you like it you can buy it. Just a note here. We’re a mom and pop type outfit. Everything’s made in our shop, none of that “Made in China” stuff here. And if you’re looking for lizards and frog designs you’ll have to go somewhere else. Our jewelry is classic and tailored and fits in anywhere. All of our sales are processed through Etsy via “Veronique’s Catalog” listed on this site. We aim to please and if you have any questions just contact us. My name’s Robert Redmond and I live in Santa Cruz CA. My email address is: roberte1106@yahoo.com. Look forward to hearing from you! 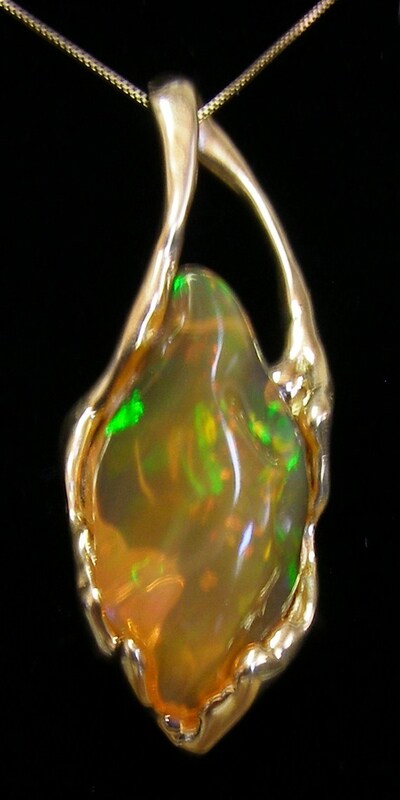 This entry was posted in Uncategorized and tagged 18K Gold Pendant, fashion, fine jewelry, large opal pendant, Mexican Fire Opal, Robert E Redmond, Santa Cruz fine jewelry, Santa Cruz jeweler, shopping, style, veronique of santa cruz, VOSC. Bookmark the permalink. Jewelry “Sampling” ~ Best of our Best!